but few people know, that he wrote about Georgia in his book named North and East Tartary. Nicolaes Witsen was the first person who in the 18th century created Georgia font by the request of Georgian King Archil. 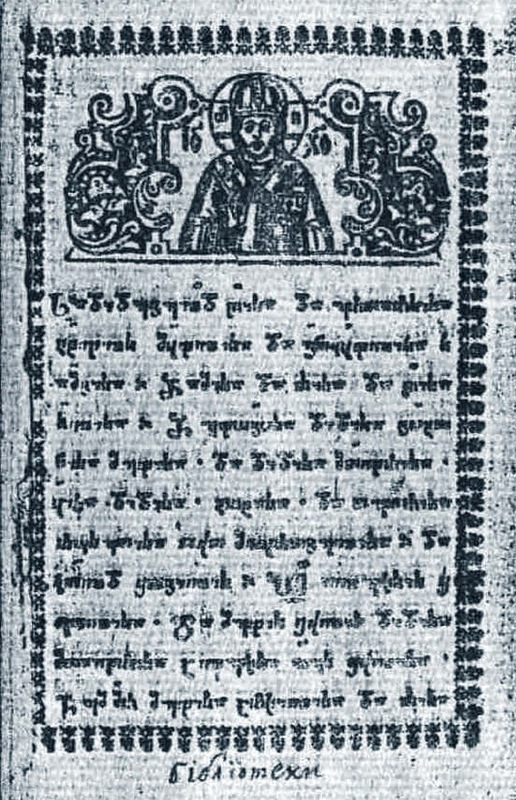 Yet before this important occasion, Italians were pioneers who published the first Georgian book in 1629.
details about the famous diplomat and his connection to Georgia, Georgian Journal contacted Artchil Djavakhadze, who lives and works in Netherlands and who translated chapters about Georgia from the book. Nicolaes Witsen lived in 1641-1717” – Artchil told the Journal, “He was a cartographer, writer, diplomat and served as the Burgomaster (Mayor) of Amsterdam 13 times. Father of Nicolaes was also a Burgomaster of Amsterdam. Nicolaes was very educated; he was maritime writer and expert of shipbuilding. His books on the subject are important sources on Dutch shipbuilding in the 17th century. . Yet Nicolaes Witsen, is more interesting to Georgians for his work, a book called North and East Tartary. The book includes deceptions about the countries from Poland to all of the eastern countries, including Georgia. At that time eastern countries in Europe were called “Tartary”, like Romans called those who were not Roman “Barbarians”. “North and East Tartary is a large book that includes information about the European countries from Ancient times untill the 17th century. Everything, that was known at that time is written in this book” – Artchil elaborated in the interview with Georgian Journal, “There are separate chapters about Georgia, western and eastern parts of the country in particular. Eastern part is called Georgia or Iberia, while western part is referred to as Megrelia. Story starts from ancient times. There are some legends, that are already forgotten in Georgia”. Artchil Djavakhadze uncovered other details about the legends, included in the book. “For example, the Black and Caspian seas were connected, but due to earthquakes and other natural disasters they were separated and the eastern part of the sea transformed into a lake. However, water there is salty and it is still called Caspian Sea, not Lake. River Rioni, in western part of Georgia, was considered as a Holy water in Greece and the Greek used to take water from the river to their homeland. There are given names of birds as well. For example, the name of Phaseant (Khokhobi in Georgian) derives from old Georgian port city Phasis, Modern Poti.”, Artchil Djavakhadze explained. According to Artchil, Nicolaes had never been to Georgia, yet he served as a diplomat in Russia andcollected information from the Catholic missionaries. His book also includes short dictionaries with Georgian and Ossetian (language of Georgia’s northern region Ossetia, currently occupied by Rusiia) words. At that time some of the members of the Georgian royal family lived in Russia, in Petersburg, or in Moscow. Diplomatic relations between Georgia and Russia were developing and they served as diplomats in Russia. It is considered, even in Russia that Peter the Great was son of Erekle I, another Georgian noble, who lived in Petersburg, added Artchil, smiling. “Alexander Bagrationi, the son of Georgian King Archil II, studied artillery in the military school of Hague. He served as the first General of the Artillery (Feldzeugmeister) of the Russian army, the second highest military rank under Peter the Great. King Peter mastered shipbuilding in Netherlands.Both of them met Nicolaes there and had friendly relations with the Dutch statesman. Alexander introduced Georgia to to Nicolaes. Later through Alexander, Nicolaes met Georgian King Archil II in Moscow”. Nicolaes was the one, who helped King Archil to publish Georgian books. “The portraits of the members of the Georgian royal family, who lived in Moscow, are also included in the book. We do not know who painted them but they should have been ordered by Nicolaes. There are pictures of King Archil and King Erekle I. “I do not want to go deep into legends, but when scientists compared pictures of King Peter and Georgian king Erekle I, they found many similarities. They say, that pictures are like two drops of water. “The book also gives description of Abkhazia, currently Georgia’s breakaway region. In the book Abkhazia is called as a part of Megrelia ,Samegrelo Region in western part of Georgia. In his writing Nicolaes even says, that Ossetia (Northern part of the country) belonged to Georgia. “Works of Nicolaes Witsen are well known to European readers. When I arrived in Netherlands in the beginning of 1990s everybody knew about Witsen, yet his works were not translated into Georgian and were uknown to the wider public”, Artchil Djavakhadze noted. “I was interested in this book. The original manuscripts of North and East Tartary are saved in the library of Amsterdam, written in an old Dutch language. In order to translate the writings into Georgian I studied the language. It took me about a year, from 2012 to 2013 to translate the book. When I finished the work, my friend connected me with the Georgian National Academy of Sciences and with their assistance I published the book. Dutch Foundation for Literature in Amsterdam also helped me and donated 1000 Euros to publish the book”.